Never again will you have to shop around to create a candy buffet with all the classic candy you know and love. This bulk candy assortment has all you need to create a classic candy buffet at a price twice as sweet. 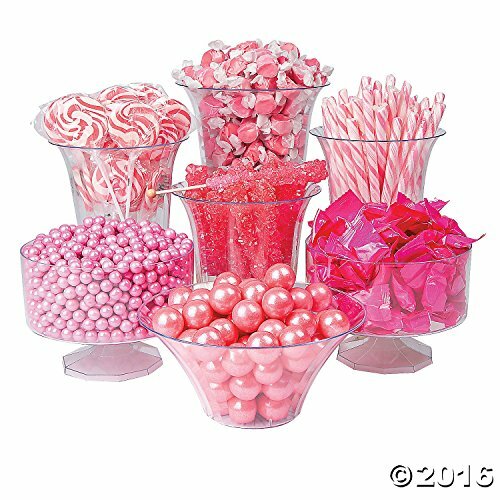 This pink candy buffet assortment makes a wonderful addition to pink ribbon events, a bachelorette party or a girl's baby shower! Need jars for displaying all these sweet treats? We've got that, too! Just keep shopping online to find jars and even popular name brand candy to complement this classic selection. Total wt., approx. 11 lbs. Gum balls - Tutti-frutti flavor. (Approx. 105-120 pcs.) Fat-free. Rock candy pops - Cherry flavor. (1 dz.) 4 1/2" pop on a 3" wooden stick. Individually wrapped. Fat-free. Salt water taffy - Strawberry flavor. (Approx. 193 pcs.) Individually wrapped. Fat-free. Candy sticks - Strawberry flavor. (80 pcs.) 5" Individually wrapped. Fat-free. Swirl pops - Watermelon flavor. (2 dz.) 2" pop on a 4 1/2" plastic stick. Individually wrapped. Fat-free. Buttermints - (Approx. 108 pcs.) Individually wrapped. Fat-free. If you have any questions about this product by orientaltrading, contact us by completing and submitting the form below. If you are looking for a specif part number, please include it with your message.